IT may, perhaps, be remembered that at a previous Paris Aero Show the Ateliers des Mureaux exhibited a Vickers-Vimy commercial aeroplane. This year the firm showed a machine of its own ДальшеMore>>> design, and a skeleton fuselage illustrating the construction. The complete machine was a parasol monoplane two-seater fighter, type 3 C.2. This was substituted for the Avion Marin which, as recorded in our issue of December 2, it had been intended to exhibit. The machine has a very unusual arrangement of its wing and undercarriage bracing, as the photograph and sketch will show, and it is difficult to see what advantage the designers expect from such a forest of struts. The wheels are each carried in a duralumin frame, which is in turn supported from fuselage and wings. The travel of the wheels is obviously very limited, while it seems probable that the air resistance of all these struts at the points where they converge must be very high indeed owing to "interference effects." 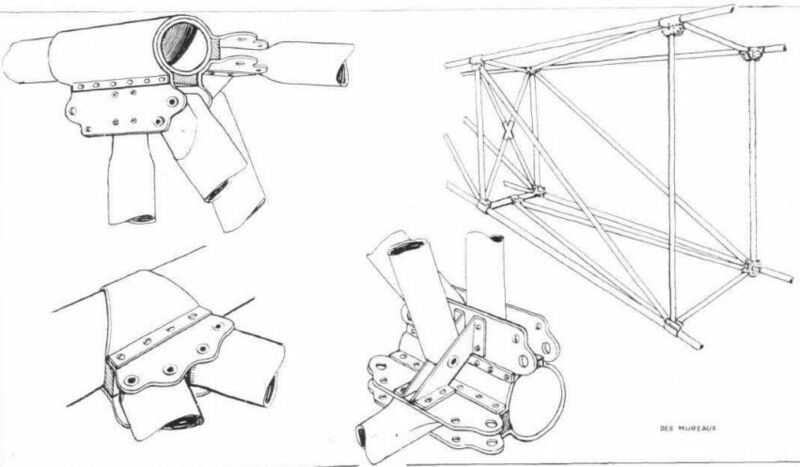 Details of the fuselage construction are shown by sketches. It will be seen that the form of construction, with plain duralumin tubes and plain sheet fittings, is very simple, and might have a good deal to recommend it if applied to a more commonsense general design. The Ateliers des Mureaux exhibited a type 3C2 with unusual monoplane wing bracing. Behind it may be seen the skeleton of an all-metal fuselage. Simple metal construction at Paris Show. These sketches show the details of the form of fuselage construction used on the Ateliers des Mureaux machines. Compared with some of the metal work exhibited this particular form is simple and should be cheap. The 3 C.2 two-seater fighter of the Ateliers des Mureaux is a parasol monoplane with unusual wing bracing.